in all my forms when i select a date from the small icon of calander provided on the right end side of date and time opeion , it never disappear after selecting a date please fix this of am i doing something wrong ? It is not supposed to disappear even after selecting a date/time -- this is by designed. this will hide the calendar icon, but you can click on the field and it will still work. 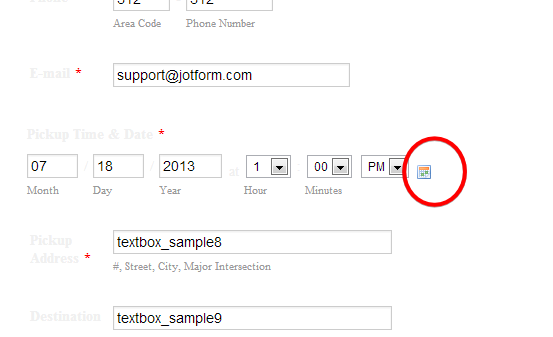 Here is a sample form with hidden calendar icon. Thanks for quick response , I don't want the calendar icon to disappear , I mean when I click the calendar pops up and after selecting a date it suppose to minimize but it still remains poped up ? I am unable to reproduce the problem you are having. Can you please let us know the URL to the form as well as the browser that you are accessing the form from. You can also try to clear your browser cache and viewing the page again.